Rarely do we get to eat in the same restaurant twice in three days. Rarely do we get to see Indian food served in style in India. Possible, but rare. Rarely is it celebrated outside of fancy hotels. Salt is one such place. I am sad that I did not get to visit this place earlier! So, we were late for shopping and early for a 1030 movie and hence after a 5 minute wait debating between the known devil, ID and an unknown angel SALT, we went for the new one, Salt. The restaurant was packed at 10 PM, but luckily the rest of those waiting were in larger groups and we got seated needing only two seats! Loved the decor at first sight. With olden Indian style (South Indian, definitely) chairs and teak looking tables, this is a modern eclectic set up deep in roots. The pinnal chairs (I don't know how to say this in English, but it is a type of woven chairs in wood), with the book shelves and quirky interiors, but a very English outdoor was a refreshing combination of decor. Very Indian and very stylish!!! Dessert first, so we asked for the Elaneer Payasam and then browed the menu. A quick bite is all we wanted and were glad to see the words, CHEF'S PLATTER SELECTION. The waiter said that we will have to leave it to the chef, but agreed to request the chef for one dish of our choice in the platter. The Zaffrani Chicken Kebab. A spiced chilly potato to add and we got ready for dessert. The payasam was thin and full of flavour. The flavours of Elaneer (tender coconut) were clear, almost felt like drinking Elaneer with a little spike! Thoroughly enjoyed it and were primed for the super spicy potatoes and quite liked them. The chef's non veg platter was really nice. While, I am not a big fan of basa fish, the chicken zaffrani with more than a hint of saffron and the nicely flavoured, but slightly dry mutton sheekh kebab was nice. Our damages were Rs. 1050. Two days later we were at the mall again and this time after a couple of hours of walking, we were reasonably hungry. Walked straight into SALT again! 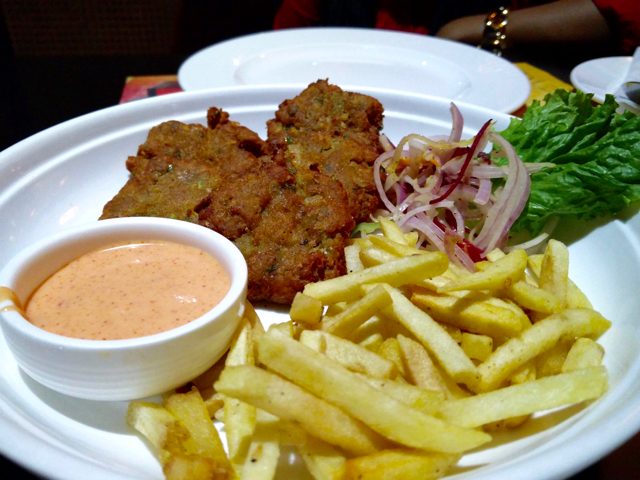 FISH WADA, 'Our take on the English Fish n Chips', was a nice description and we went for it. I loved it, despite it being BASA. 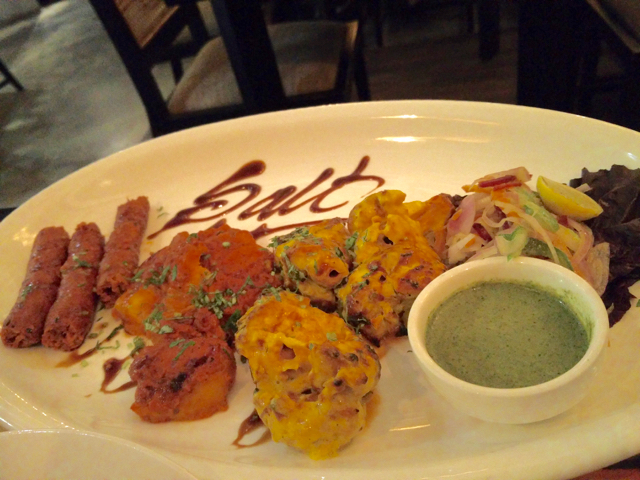 It was indeed a nice Indian take on the Fish n Chips, with it really resembling a vada. The Fish Kofta Biriyani from their Coastal Food Festival menu was really spicy, but quite nice too! Platter for dessert and this time the Elaneer Payasam that was part of the platter was thicker. The first time, it was thinner with more Elaneer flavour, this time it was thicker with more coconut milk flavour. I think I preferred the thinner one. Carrot Halwa and a very home made brownie finished the platter and we were quite happy!!! Damages were Rs. 1250. The festival biriyani was expensive at Rs. 445! Service was outstanding both times. Waiters had a reasonable knowledge about the menu and checked the status of our food and if we liked it, but without being intrusive. I would really like to visit Salt more often and try out their other stuff on the menu. May be I missed it all along, but it does seem like one of the most under rated Indian restaurants in Chennai. Combing the decor and the food, this is must visit when in Chennai! 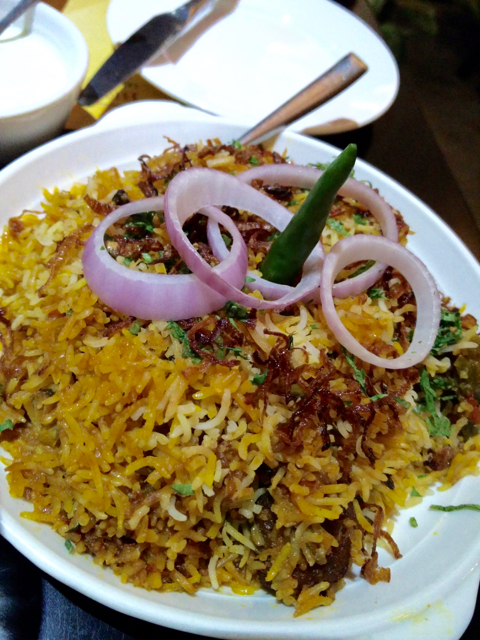 SALT is the Indian restaurant in the second floor of the Forum Vijaya Mall, Vadapalani.